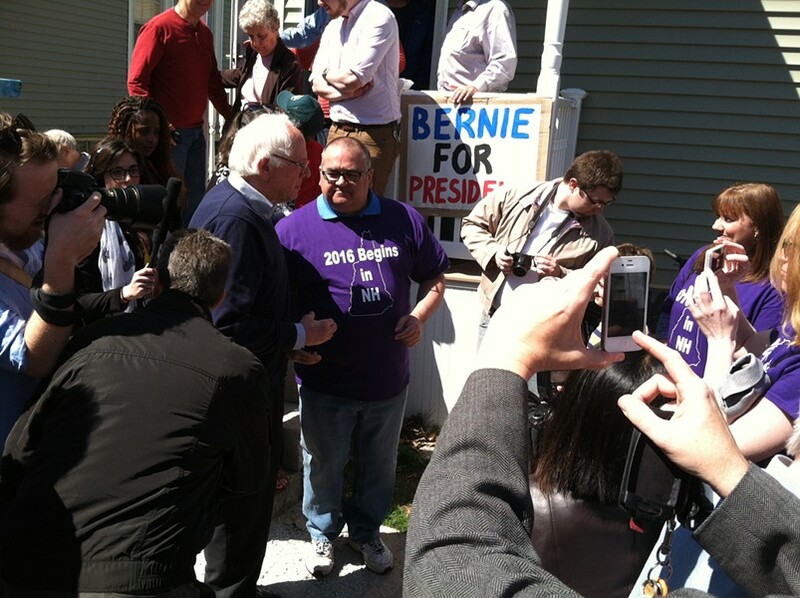 Sen. Bernie Sanders (I-Vt.) campaigns in May in New Hampshire. Tony Basiliere will have a dozen people — mostly friends but some strangers — over to his South Burlington home next Wednesday evening. Basiliere says he’s not much of an entertainer and has no plans to set out hors d’oeuvres, though he might serve coffee. What he’s really dishing up is Bernie Sanders. Basiliere is among hundreds of people who are hosting events around the country Wednesday night to spread the word about the Democratic presidential candidate. This is taking the Tupperware party technique to politics. Back in 2004, when Howard Dean was running for president, his campaign supporters held meet-ups around the country. Now, the Sanders campaign is encouraging supporters to organize events Wednesday at homes, coffee shops and union halls from Maine to California. Sanders hopes the events will provide those interested in his campaign ideas for how they can help, said spokesman Michael Briggs. “He’s looking for the grassroots movement that he keeps talking about,” Briggs said. The campaign makes the events easy to find online via ZIP code. Some regions are replete with offerings; others have none. If you live in Del Rio, Texas, you won’t find one within 100 miles. If you live in Jamestown, N.Y., you can choose from 21 events within 100 miles. In Springfield, Ohio, Alex Coventry has had to work hard to spread the word about the independent senator who is running in the Democratic presidential primary. He’s organizing meetings from Columbus to Dayton. “In Columbus, it’s going like gangbusters. We’ve hired a big hall that can hold 360 people,” he said. Coventry is convinced that this house-by-house and hall-by-hall technique is Sanders’ path to victory. “He can’t rely on mainstream media publicity,” he said. In Vermont, dozens of gatherings are planned Wednesday. Those who live in Williston can pick from 72 events within 100 miles, including 11 in Chittenden County, most of which are in private homes such as Basiliere’s. Basiliere doesn’t quite know what to expect at the meeting. Sanders is due to provide a live-stream speech. Basiliere presumes Sanders’ campaign will ask him to collect contact information and solicit contributions from his guests. And Basiliere loves to talk about Sanders, politics and what’s wrong with the world, so he can fill in any gaps.